Yesterday's links to James Reasoner's interview and to the J. C. Penney catalog from 1976 sent me into a veritable frenzy of nostalgia, from which I have yet to recover. In the late '70s, I'd been contributing reviews and articles to mystery fanzines for years, starting with Len and June Moffatt's JDM Bibliophile, Lianne Carlin's The Mystery Lover's Newsletter (the title later changed to The Mystery Reader's Newsletter) and Al Hubin's The Armchair Detective. I continued in such fabulous venues as Jeff Meyerson's The Poisoned Pen, Guy Townsend's The Mystery FANcier, and Andy Jaysnovitch's The Not-So Private-Eye. Later on, there was MDM Cap'n Bob Napier's inimitable letterzine. It was around 1976 that Steve Lewis' personalzine The Fatal Kiss that lured me into the ranks of DAPA-Em, where I remain happily ensconced today. From letters appearing in some of the fanzines, I learned about two other Texas mystery fans, both of them on their way to becoming famous: James Reasoner and Joe Lansdale. I was at an AggieCon around 1979 when I saw a guy and his wife sitting in the hallway outside the dealer's room. I read the guy's nametag and discovered that he was Joe Lansdale. I still remember how I introduced myself: "I think I know you from another fandom." Joe was skeptical (go figure), but when I told him I'd been reading his letters in The Mystery FANcier and The Poisoned Pen, we immediately became pals. We began corresponding right after the convention. I'd already been corresponding with James, I believe, thanks to letters in the same fanzines. Even then, James wasn't big on attending conventions, so I hadn't met him yet. That would come a little later. 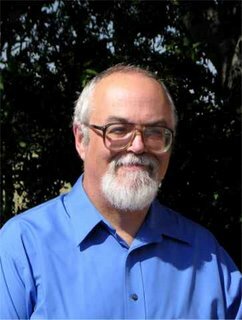 I was living in Brownwood, Texas, teaching at Howard Payne University, where I was in a writers' group with four or five others. I was writing poetry, some of which was being published in little magazines, and even in a couple of national magazines. Jack Davis, husband of one of the group members, is the one who suggested that he and I could write a Nick Carter novel. 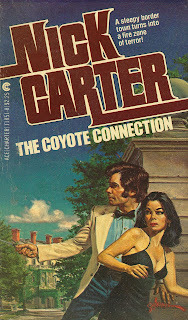 I wasn't so sure, but Jack sent off for the guidelines, and we got started on what was to become The Coyote Connection, which eventually sold and which was published in January 1981. At the same time Jack and I were writing The Coyote Connection, James was working on Texas Wind, and Joe was writing, among other things, Act of Love. All three of those books came out about the same time, and I can well remember how elated all three of us were. I was getting a much later start than James and Joe, a point that was brought home forcefully to me at the 1981 AggieCon when I met Lew Shiner. He spotted me in the dealer's room and introduced himself, saying that Joe Lansdale had told him he should meet me. I've never forgotten Lew's next words: "I thought you were a young guy, like us." While I've never forgotten, I have, over the years, managed to forgive him. As I mentioned, James and Joe have gone on to fame and fortune. The fanzines, I'm sad to say, have all but disappeared. Certainly the print versions are long gone. Sure, rara-avis, DorothyL, Crimespace, and The Big Adios are great. And Mystery*File is a wonderful resource, but I miss the print zines. We have things like Crimespree, The Mystery Readers Journal, and Mystery Scene, but it's not quite the same. Yesterday was the birthday of F. Scott Fitzgerald, who said it much better than I can: "So we beat on, boats against the current, borne back ceaselessly into the past." Well, some of us, anyway. We were all younger then. Yeah, none of us are young guys anymore, are we? Great post, Bill. THE NOT SO PRIVATE EYE doesn't get mentioned much these days, but it was a wonderful fanzine that introduced me to the work of a lot of hardboiled writers I hadn't heard of before then. And, of course, to you and Joe. Compared to me, you two are still youngsters! I dunno...I think we've all reached the point where 5-10 years isn't seeming like all that much any more. Except when contemplating political candidates and their terms. That is a great short essay, Bill. Hell, I miss THE SCREAM FACTORY, which was much like a very informal horror-oriented THE ARMCHAIR DETECTIVE, and SCIENCE FICTION EYE. And. That there are things similar to, but not quite the same as, things we once loved just makes them that much more thoroughly missed. And when there's nothing like them at all, then there's not even any methadone. I miss THE SCREAM FACTORY, too. I might have had an article in that one, even. I'm right with you all, no longer a youngster. I remember those Nick Carters well. I'm sure I read The Coyote Connection as I don't think I ever missed one way back then. But I got rid of them years ago, a decision I've regretted for long time. But you know how it is. You run out of room and have to start weeding down the collection so there will be room for all the new stuff to come. Through the mists of nostalgia, I remember reading Coyote Connection as my first Nick Carter. I did because I knew you, Bill. Sadly, I think my copy's disappeared with a sackful of Carters that found their way to a garage sale. If I still have it, it's been lost in the shuffle of too many moves. Not a great loss, I'd say. In other words, Bill, we've known each other for over 30 years, and we've met only once? Or at least I think we did, didn't we? It can't all be in my head, can it? It was at a Washington DC Bouchercon, or was it Philadelphia? I know I met a number of people for the first and (so far) only time. Where you there? I was there at both D. C. Bouchercons and at both in Philadelphia, so we met at one of them. I just don't recall which one. Hard to believe it's been over 30 years. As I asked James Reasoner today, What happened to the '80s? And the '90s? All I can say is: lovely post, Bill. I was at the D.C. B'con and I'm sure Steve Lewis wasn't, so you guys probably met in Philly, which I missed. I did have the luck of meeting Martin Morse Wooster in D.C., however. I hadn't thought about it, but there aren't many, if any, fanish fanzines around anymore. Maybe CADS, Geoff Bradley's fine zine from England. If you'd like to revive MDM, you'll have my complete support. I'm not that crazy, Cap'n. Thanks for your memories, Bill. I'd heard the stories about James's and your first books, but didn't realize you knew at the time. (And Joe Lansdale too.) As for Finland, there hasn't really been a crime fiction fanzine up to my publications. The Finnish Whodunit Society's magazine was almost pro from the start, even though they started paying only after over ten years' publication (and when I started writing for them). If I'd gotten paid for everything I wrote in the long-ago, I'd be a rich guy today. That was a good essay. One of your best posts. Thanks, Gerard. I thought about including a Paris Hilton photo, but I decided to go with the book cover because I love those sideburns. Thank you, Bill, for sharing this. I appreciate the comments as well. I missed all of this by being a teenager in High School in the late 70s and not having a clue. Great piece! Jud Sapp introduced me to DAPA-EM, which i joined, alas, some time after his early death. Before that I was at the 1981 Bouchercon in Milwaukee and met Art Scott and Joe Lansdale and others my tired brain is unable to recall at the moment. CADS is more like the Armchair Detective in its heyday. I do miss TAD. I was interested in seeing Todd's mention of Science Fiction Eye. I watched the birth of that one as I was in a writers group with Steve Brown and quite a few SF writers including Ted White, Dave Bischoff, and a bunch of others. I guess my favorite SF fanzine was Richard Geis' Science Fiction Review. Oh, to be in Anchorage . . .
A Musical Tribute to Bettie Page? Sigh. I Miss the '70s.